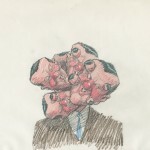 This 1988 Academy Award nominee is the film that set the style and started the career of Bill Plympton. One of the most profitable short films ever made, it’s still showing all over the world. As a second-rate crooner sings about the beauties of his lover’s face, his own face metamorphosizes into the most surreal shapes and contortions possible. The music was written and sung by Maureen McElheron. An original drawing from the 1987 short, “Your Face”.